All the people some of the time and some of the people all of the time come under pressure. Pressure to perform. Pressure to live up to the reputation or expectations. Pressure to deliver. Pressure to stay ahead. 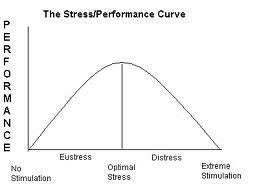 All sorts of pressures at times create a menace of a person where he/she is unable to do either of the several tasks to the best, and keeps getting slower right up to a point of burn out where the stress levels move beyond the eustress (positive stress) to distress (negative stress). Prioritize work: As you already cannot handle the amount of work to do, it’s better to prioritize and concentrate on work that’s most important first. It will create a calm inside when important work gets done, and you will also feel better about your sense of achievement. Create time lines, and follow them: Some work situations come up that demand an insane amount of time to get done with. It’s fine if that was scheduled and the work requires that kind of work, but many times one would end up spending a lot of time on simple work to either improvise that to perfection, or correct that one simple error where work’s stuck. It’s not a good idea to wait too much there, you might as well come back to fix it when you’re done and your mind is free. Make time for play: As odd as it may sound, when you are really overworked, you mind actually starts to work slowly. Consider some play time in between to increase the pace of things. For instance, consider playing a quick game of Table Tennis once you’re done with 40 sales calls; knowing you’ll get to play the game, your mind would automatically focus on making things quicker. Reward yourself: To keep yourself interested and give work a little push, you need to carry out some “Pavlovian Incentivization” where you make smaller targets within broad goals and set fixed rewards for such small achievements. For example, treat yourself with a chocolate once you achieve one sales target. Learn Something New: As your mind starts to get easy with the schedule, it just doesn’t get the spark anymore. As you engage into something totally different and new to you, like learning a musical instrument or a new language or an adventure sport, your mind suddenly gets signals to get ready for something new. It turns alert and that’s how you get regular work done quickly as well. Moreover, when something new like that is learnt, certain chemical reactions release dopamine in your mind naturally, which increases the happiness and satisfaction component in your life. Life’s not about losing it out on small, petty issues. It’s a big blessing that needs to be valued and lived fully. Using the above steps would help you do just that. Even if only a small proportion of my readers manage to live their lives more fully after reading this, I would be very glad to know. Do write me if this helped you in any way. Previous PostPrevious Is all good Apple? – why did Steve take another medical leave, please?